Search Results for "surgery light"
Low Angle Shot of Two Professional Surgeons Turning on Surgery Lights while Bending over Patient. POV Patient Shot in Modern Hospital Operating Room. Shot on RED EPIC-W 8K Helium Cinema Camera. Low Angle Shot Falling Asleep POV Patient View: Two Professional Surgeons Turning on Surgery Lights while Anesthesiologist Puts on Anesthesia Mask. Shot on RED EPIC-W 8K Helium Cinema Camera. Preparation for the beginning of surgical operation with a cut. Team surgeon at work in operating room. Surgical light in the operating room. Emergency Department: Doctors, Nurses and Surgeons Push Gurney / Stretcher with Seriously Injured Patient towards the Operating Room. Light Dramatically Turns on. Shot on RED EPIC-W 8K Helium Cinema Camera. Modern hospital operating room with steel sterile medical instruments. 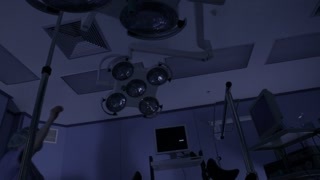 Surgical blue light in the operating room. Preparation for the beginning of surgical operation, all members are at places. Operating emergency room surgery theater lighting in hospital to enable surgeon to see well in operations. Empty modern surgery with no light. 4K. Surgery modern LED light and hand switches it on and off. Establishing Shot of Technologically Advanced Operating Room with No People, Ready for Surgery. Real Modern Operating TheaterWith Working Equipment, Lights and Computers Ready for Surgeons and a Patients. Shot on RED EPIC-W 8K Helium Cinema Camera. Surgical lights switch on and off in a surgery, operating theatre. Contemporary innovative surgical light provides the best lighting field during surgery without shadow areas. Turning Lights On in Operating Room. Team of Doctors and Nurses over Patient. Patient Point of View. A light from an Operating Theatre turned on and off.